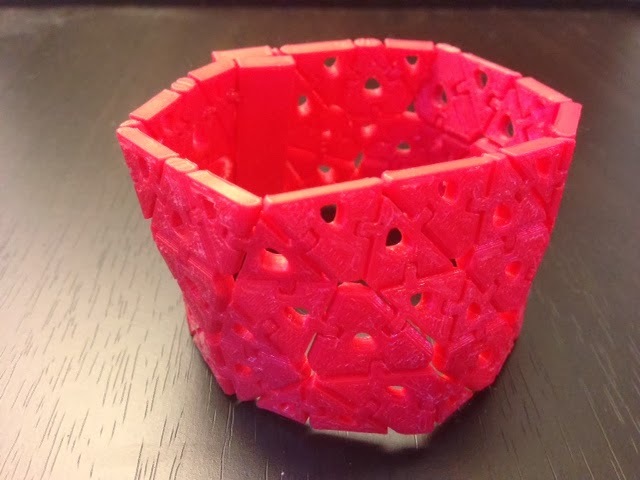 The design studio Nervous System has put up a great free morphing/algorithmic/supercool bracelet-making site at Kinematics@home where you can modify bracelet designs within certain parameters and then either download an .stl file or send the design off to be 3D-printed for you. I need larger bracelets than what I can usually find in a store so the ability to set my own bracelet length was great! Settings: MakerWare .2mm/standard, since the bracelets from Kinematics are optimized for that layer height. Technical notes: The hinges use cones just like the ones in the polyhedral nets from Days 80-86, but the hinges are the easy and obvious part. The hard part is everything else that Nervous System does, from generating structures algorithmically in a live online interface to figuring out how to print an entire dress in a crumpled-up ball that fits into a small building area.